Bill was pleased before seeing our Sospel, France hotel room for our 2 night stay as it had to be better than the one we'd booked in advance. He'd phone reserved the other room to ensure that we had some place to stay but rejected it upon arrival because it was hopelessly dark and small. 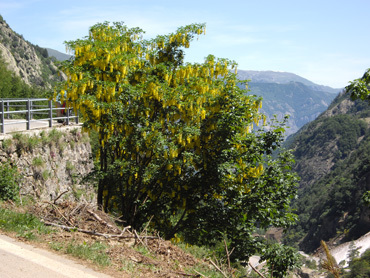 Who would have though laburnum would be in the Alps? Once in the door of our quickly substituted room, he immediately busied himself with unlatching and opening the balcony windows and shutters, righted the pair of plastic chairs tipped to shed rain, and sat himself down. I went back in the room to begin the settling-in process and Bill remained planted in his chair. A few minutes later I joined him to share in his pleasure on the little balcony. He had the upright posture and serenity of one engaged in deep meditation and yet was grinning from ear to ear, one of those "cat who swallowed the canary" grins. "I love the Alps" was all he said and he grinned some more as he gazed out on to the steep slopes of our narrow gorge. For the glass-half-empty folks, it had been a frustrating day, one full of hiccups. Since we were to do some climbing on this first day in the mountains, we'd intended to get an early start but we didn't make it on the road until 11:30. My shoulder discomfort through the night left us both short of sleep so when the alarm went off, we had rolled over and slept another hour. Then it was visiting with our Italian B&B hostess who found our story of embracing radical change to be compelling. She wouldn't possibly travel by bike but understood our journey was about self-exploration, self-confrontation, and change. She understood that it wasn't about the bike. I couldn't abruptly walk away from someone who had just been nudged to visualize her own transformation. When we did exit the gates of the coastal B&B garden, it was then on to the requisite stop at the market for bread for lunch and the evening's frozen vegetables that would double as my lunchtime ice-packs for my shoulder. There was one set-back after another. We took the wrong road out of Ventimiglia, Italy as we tried to turn away from the sea into the mountains. With the help of Garmin's maps, Bill was able to improve on the original route by using a maze of miniscule back roads early in the ride in Italy. Lunch was more than an hour late because of the absolute lack of shady place to sit off the road before then. 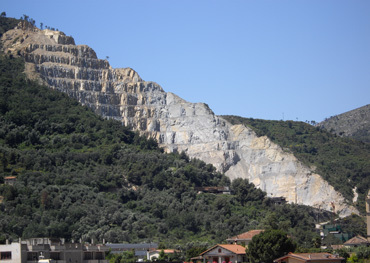 This Italian quarry reminded us that we were heading into the hills. This day that was to be a 1000' gain day, a warm-up for the tougher next climb, but it turned out to be over 2000' in gain with punishing 12% grades. Then there was the 'burrow'-like room that we'd unwittingly reserved at our destination. Had our stay been planned for a single night, we would have shrugged our shoulders and accepted the depressing room. But the next day was a resting/hiking day and we wouldn't want to spend the long evening in a dark hole. 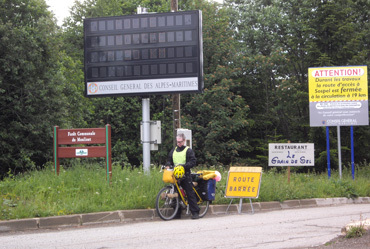 Bill usually does the talking in France because of his language skills but my bike was already unloaded so I volunteered to inquire at the first hotel we'd seen on the way into town. As I pedaled off, Bill announced his personal upper price limit to escape the burrow--a number that I knew wasn't fixed but underscored his level of motivation for a better room. I was in luck. There was a third hotel that looked fresher than either of the other 2 choices we'd seen. They'd remodeled 2 of their 3 floors and given it was Sunday night in shoulder season, I had my pick. The hostess accommodated me with a 3rd choice when I wasn't quite satisfied with the first 2 offerings. And the 3rd one was a winner. Bright and cheery with full-length glass doors onto the small balcony and almost full-length windows in addition. The uplifting Mediterranean-yellow on the walls, the new flooring, the new bathroom, and the bathtub were a delight--all for a figure well under Bill's "dig me out of a hole" price point. Charming Sospel, France was decked out in flowers. Our sweet room was typical of our day of hiccups, a day which we fortunately experienced from a "glass-half-full" perspective. The late start was a disappointment but not a crisis--we had enough time to give to some extra sleep and to give to another person contemplating a transformation. The wrong-way out of town turned out to be an idyllic ride, though one that would not have been possible without GPS to weave us through the back roads. The tunnel bypass road that Garmin said wasn't a through road was indeed through, though it required some 2-to-a-bike pushing through gravel. Tunnels are a terrible place for us and the long bypass circumvented a series of tunnels and gave us an extended interval of traffic-free riding. Lunch was entirely too late on this day but at last, we'd found a withered picnic table under a fine alder tree on a breezy bend in the road just far enough away from the traffic. It was the only such place we saw the entire day until almost dinner time. 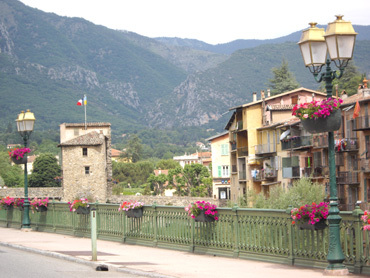 Our little town of Sospel that we thought might be little more than a wide-spot in the road was a typically proud and charming French village sporting flower boxes on the bridges and benches along the river promenade. And then there had been the reversal of our accommodation fate. We purred all evening as we took turns soaking in the rare tub; enjoyed the conveniences of a new bathroom with ample counter space and a large sink to support our food preparation, laundry chores, and rinsing of our assortment of water containers; and enjoying the sound of the river as we stared at the in-your-face slopes. No place is perfect and we lamented the tiny bed so typical of France. I immediately began scheming as to how I could bungee a chair to the side of the bed to help hold in place the pillows I needed to support my arm through the night. My cumbersome, makeshift arm supports were like having the family dog in bed and fortunately in Italy the beds had been generous enough, but that wouldn't be the case that night. And the missing sink stopper had me digging into my 'kit' for a substitute and our little-used sink drain strainer. But as Bill grinningly said "We are in the Alps" and it was gorgeous. The mountains weren't as stunning as the craggy Dolomites much farther east, but these Maritime Alps were handsome and interesting in their own right. We "Ooo'ed" and "Ah'ed" and stopped and stared as we made our way up and down the steep faces that first day. The heavy humidity that had haunted the coastline for a week or more was slipping away and it vanished in the mountains. Clear, bright skies; the sounds of birds and rushing water; and forests that changed their compositions as we left the wet, coastal-side of the mountains and turned inland to the drier side were all delightful. The mountains are always hard work and not all of them are worth the effort, but Day #1 in the Maritime Alps boded well for the days and weeks ahead. Our second riding day in the Maritime Alps would be a doozy as we'd rack-up over 4,000' in elevation gain along the way. That's the kind of daily gain we usually only do a few times a year though didn't have a single such day in 2008. Considering that we were only 2 weeks into our reconditioning after our junket to Malta and I was dealing with discomfort from my still-recovering shoulder, it was at the limit of what we could prudently take on. Ultimately it was only because the climbbybike.com website had profiled the route that we decided to do it. We knew from experience that their satellite-generated profiling slightly underestimated the difficulty but it indicated no grades over 10% and no gain hidden in mid-climb descents. I was willing to dig deep into my reserves so that Map Man could connect the dots on his route since I had the assurance that there would be no unpleasant surprises. Because of our just-good-enough conditioning and my shoulder issues, I accepted Bill's offers to ameliorate these early routes with rest days. The first was a lay-over day of hiking at Sospel so I'd have a relative-rest day before "the big climb" to the Col; the second was to stay at the top of the Col de Turini at the end of the day rather than make the descent into the next valley as we would usually do. The continuous isometric weight bearing of braking for an hour or 2 descent would potentially enrage my shoulder and I didn't want to layer that tantrum on top of the stresses of a hard climbing day. In hindsight, what was prudent for my shoulder turned out to be the optimal strategy for both of us under the best of conditions. The climb into Sospel had been steeper than we expected and it had one of those hidden, mid-climb descents at the border that doubled our elevation gain for the day. The day-off at Sospel that was a concession to my shoulder would have been a necessity for both of us before taking on the big Col.
Tackling the Col itself also brought its own surprises. After having talked with the friendly tourist info folks at Sospel several times about biking into the mountains we were stunned to find a sign on the edge of town the next morning indicating that the road to the Col was closed. It was unfathomable to us that there was no such signage in the miles before the closure or that the tourist info folks didn't mention it. Stunned, we rode back down the short hill and waited for tourist info to open for more information. Pretty views but little exposed geology to capture one's gaze. Indeed the posted alternate route was an option for cyclists. It would add about 5 miles to the day, which wasn't too big of a penalty. But we'd lost our early start while waiting for road information; we'd lost the predictability of the climbing as we had no profile for the alternate route. We hadn't even started and already stopping for the night at the top was looking like an even wiser decision as this climbing day that had just barely been in reach became more difficult, but to an unknown degree. It had already been a grueling day on the way to Col de Turini, a day laced with unwelcome route uncertainty, when the temperatures plummeted for the last 5 miles of this often hot riding day. We sat-out the unexpected rain under an eve and then in a bus shelter for almost an hour before donning our rain gear and pressing on. The nearby patches of blue sky suggested an imminent clearing but they never won-out over the rain filled clouds. But it was just as well that we bundled up and went on as the temperatures had dropped into the high 40's F and in 2 more hours the steady drizzle we finished the day in would become a wind-whipped downpour that lasted for hours. Not much to see at Col de Turini itself--mostly road closure signs. We congratulated ourselves at the end of the long riding day as we'd both correctly assessed our capacity for this climb in which the elevation gain was 15-20% greater than expected and we'd paced ourselves well so we still had our wits about us at the end. It had been a day of the unexpected and yet we'd been able to salvage the day and salvage the route into the more northern, more remote Maritime Alps of France. We'd enjoyed warming, long soaks in the welcome bathtub; eaten our dinner; and used masking tape to block the substantial drafts coming in around the exterior door of our our 'rustic' ski resort room and then there was something inappropriately hard in my mouth with the tiny piece of bedside candy. I was in shock when I spit it out and discovered one of my gold inlays with a chunk of tooth attached to it. I was too tired at that point to be upset; instead I was stuck in a state of disbelief. Here we were at the top of a high mountain at a wide spot in the road on a stormy night with nothing more around than 2 other funky hotels and there I sat with some of my dental work in my hand. Matters weren't helped by learning that this hotel that advertised internet access had none at the moment due to a fierce wind storm 4 days prior. If there had been good internet access, we could have used our Skype internet phone to make some calls. And even if it was limited to surfing, internet access would have opened up our options. When I collected enough of myself to function, I used Bill's cell phone to call my dentist's office for some guidance. Mid-sentence I was cut-off and later learned it was because I'd quickly run out of time on the our new French cell phone account. We were in too remote of a place to 'buy more minutes' so we'd just lost our last contact with the outside world for problem solving. Luckily Bill stumbled into my model of 'being right for the wrong reason' as he had a pile of regional info sheets, including train schedules, in his pannier. They were to have been thrown out before the big climb to save weight but our lack of internet access in France had prevented him from double-checking that he'd correctly entered the string of websites into our Country Details file. When we should have been crawling into bed after a hard riding day, we were looking at maps, schedules, and brochures to formulate a plan. I had no pain from the failure in my dental work but we didn't know how long that would last. Should something more snap-off or wear-through and leave me in unremitting pain, we didn't want to be on an even more remote mountain top. Three days into this route that Bill spent days crafting, we abandoned it. In the morning we'd fly down through the hard-won miles we'd just climbed up and then hop on a train when we got back to the tracks. Nice, France was the top of our 3 choices of destinations we could make the next day as it was the biggest city and therefore the most likely to have an English-speaking dentist. But we'd been in Nice and bigger isn't always better for finding obscure locations if you don't have a car. Ventimiglia just across the French border into Italy was very appealing as our collective Italian skills were better than Bill's French skills. Had our B&B hosts in Ventimiglia's suburbs not just left on a 10 day vacation, Ventimiglia would have been our first choice. Surely our friendly hosts that we spent so much time talking with about our lives would recommend a dentist and perhaps even translate for us. But they were off on vacation in the Italian mountains. 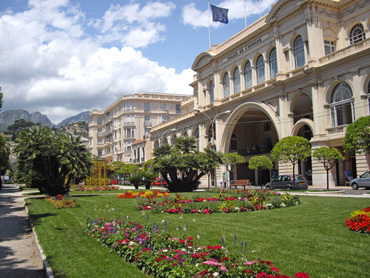 Menton's park and flower beds: symbols of it having a city core. Menton, the French seaside town we'd biked into for a day for the sole purpose of buying a phone chip, was my final choice. Unlike Ventimiglia, Menton had a consolidated central business district which would likely host several dentists. And unlike Nice, both the city and central core were small and walkable. We'd spotted a chain hotel on the way into Menton that we could likely stay at and we knew our way to tourist info, so Menton looked like the least frustrating place to tackle our problem. The failure of my dental work caused me no physical pain but it triggered a heap of psychic pain and I was emotionally numb. Bill had been on cloud nine with finally being in the mountains and my dental event jerked us out of the his mountain event and shattered his route. I knew neither of us would have the heart to do that alternate route to Col de Turini a second time to resume his itinerary. For myself, I could hardly bear the thought of losing my conditioning edge again with unknown days being spent in Menton dealing with my tooth and then having to slog through the muscle aches and pains for a 4th time this year. And given that I was still nursing my shoulder injury, it didn't feel good to be the source of another trip-altering health problem. 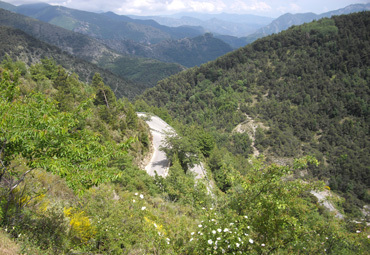 As we road down the steep, narrow switchbacks to catch the train to Menton, I told Bill that my highest priority was to retain what conditioning I could. We were guessing that with the approaching weekend that we could easily be tied to Menton for 5 days while we located a dentist, made an appointment, and then learned what could to be done. Now we went downhill all those same switchbacks. Having the train time table with us helped immensely as we could develop a schedule for the day and pace ourselves to make it happen. The ambitious planner side of my mind rallied through my emotional pain and set the goal of locating a dentist on this very day. If we could catch the 2 targeted trains, we could be in Menton in the early afternoon. We knew right where to go for the budget hotel and we'd drop our bikes and gear there. Then we'd walk into Menton center and squeeze hard on the tourist info folks to help us locate an English speaking dentist. I was crestfallen when after sailing into the first train station town and buying more minutes for our phone, that it accomplished absolutely nothing. I'd hoped to accelerate the whole scenario by both reserving our hotel room and beginning the process of finding a dentist with the tourist info staff before arriving in Menton. But no one answered the phone at the hotel and the clerk who answered at tourist had such weak English skills that she wasn't able to understand when I asked for their business hours. Once again I felt doomed to a long, drawn-out process. Luckily, we made our 2 trains and there was a room available at the Menton budget hotel we'd targeted. We quickly dropped off our bags and bikes and changed into our walking shoes and were off for the second stage of the day. As we walked towards Menton's tourist info office, we looked for dental office signs on the street though found none. On a lark, I popped into a pharmacy and inquired about dentists as European pharmacies define their role more broadly than is the case in the US. The staff knew of a dentist nearby and an elderly customer offered to walk us there. Unfortunately the office seemed to be closed for remodeling and we went on. Now finding any dentist, let alone an English-speaking one, seemed to be the problem. A few blocks from the tourist info office Bill spotted a plaque for a trio of dentists in a single office. We pressed the buzzer to let us inside the faded old building with no reception area. We both felt ourselves physically contracting and becoming disheartened as we walked up the broad staircase and looked at the peeling paint and general disrepair of the interior in the dim light. The backlit neon sign over the door to the dental office looked like it was from a 1940's hotel. We paused outside the door and agreed that we'd peek in and if it was too creepy, that we'd close the door and leave. As we turned the knob I desperately hoped the office didn't look like my childhood dentist's office that had gotten stuck in a time warp. We were instantly relieved as we stepped into a bright and cheery, open-office designed space. The colors, the furniture, the lighting, the visible equipment all spoke to a modern, going, concern. The dentist happened by as I asked his assistant/receptionist if she spoke English. He smiled and came towards us, saying he spoke very little. But the inlay in my open palm and 4 carefully chosen word-clusters in French--including "returning home in December"--told him all he needed to know. With a sympathetic expression, he asked if we could return in an hour. Without completing any paperwork or even exchanging names, I was in his chair at 6 pm and he had his English speaking wife on his cell phone. This very gentle man was clearly committed to being supportive, being helpful, and wasn't about to let the language barrier be a problem. He looked and poked, spoke to his wife, and I spoke with her. I filled-in some of the words she was missing and he nodded, clearly being in that place of understanding more in English than he could organize to say. By the time I finished speaking with her we were all 3 convinced that we were on the same page about the choices, the timing, and the cost. Re-cementing the old inlay would have been the cheap and quick solution but it wasn't possible because a part of the tooth had snapped off. Given that remedy was out, the only viable option was to have an impression taken and a new inlay made. It wasn't what I wanted, but it wasn't a hard decision to make. It was a leap of faith that this so-far nameless dentist would produce a high quality product but given the circumstances, gut feelings were all I had to go on. The gut said "Do it", so I said "Yes." Just like at home, the inlay production would require 2 weeks and I had a return appointment on the books before we left. Amazingly, it was still less than 24 hours since the tooth snapped and the inlay fell out and there was nothing more to do about it for 2 weeks but live with the awkward gap in my mouth. Bill's head was spinning. 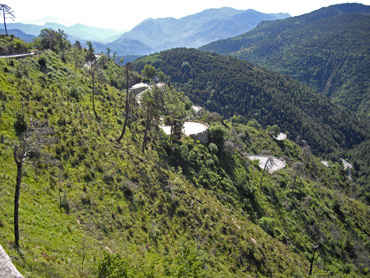 He'd worked so hard to develop a route for touring the Maritime Alps, including coming to Menton for a phone chip. Three days into the route, his plan was in tatters and we didn't know if we'd be doing much more than a few day trips from Menton for a week or so. And just as suddenly, cyclotouring was back on--but only for a 2 week loop. Bill's Maritime Alps plan had been crafted to head us north and then we'd turn due east and make a beeline for our July 4th reservations in the Dolomites. Now what we needed was a 2 week circle from Menton to Menton and then a train-assisted dash to the Dolomites. After his head stopped swirling and he was breathing normally again, he took on the itinerary challenge and my request to retain my conditioning. Amazingly, we'd made it to Menton without missing a riding day, so he was off to a good start. Yesterday we ended our 2 week stay in Selva di Val Gardena by riding over Passo di Gardena so as to begin our 1 week stay in Corvara in the 'next valley' of Alta Badia. We'd loved to have stayed in Selva but high season prices are now in effect there. We've never been willing to pay the premium and the weak dollar makes it even less compelling this year. The weather has crimped many of our plans in the mountains as the threat of thunderstorms has been almost daily for about a month. We slipped in 3 Via Ferrata's and got caught where we wished we weren't in 2 thunderstorms. And Egads! but it snowed last Saturday morning as we headed out on foot to a mountain hut for a 2 night stay to do a long Via Ferrata. The big hail storm during dinner last night followed by a couple of hours of thunder and lightning suggests that our luck with the weather has yet to turn. But there have been long hours of dry spells so, with a bit of planning, we haven't been wearing our rain suits all that much and are still thrilled to be here. Unlike rainy spells back home, here the sun makes a convincing showing every day.